The Stó:lō Nation Society, as it exists today, evolved from several organizations that emerged in response to the Trudeau government's 1969 Liberal Indian Policy, usually referred to as the White Paper. If successful, the White Paper would have resulted in changes to the Statutes of Canada and the British North America Act. The Department of Indian Affairs (DIA) would have ceased to exist and all benefits accorded to Status Indians would have ended. Aboriginal people across Canada would have been assimilated according to federal and provincial government policies. DIA Indian Agencies became known as District Councils in the 1960's. The East Fraser District Council (EFDC) was a grouping of twenty four Stó:lō bands between Fort Langley and Yale. District Councils were intended to facilitate the administration of DIA benefits and services but had the unanticipated effect of creating cohesion amongst the members who began to focus on rights and title and the “land question”. In November of 1975, the EFDC presented the Land Claims Action Proposal to the UBCIC. It started with the statement that “This is not a proposal for land claims research; it is a proposal for land claims action.” and went on to say “Land Claims is directly related to the everyday needs of (1) housing (2) employment opportunities (3) education, etc.” The Stó:lō Declaration and the Declaration of Native Title presented by the EFDC at this time are clearly based on the same principles. The Chilliwack Area Indian Council (CAIC) was formed in 1970 when the local DIA office was closed. Initially representing 21 bands, by 1975 there were 14 member bands and Chief Richard Malloway (Yakweakwioose), Chief Sam Douglas (Cheam) and Chief Andrew Alex (Union Bar) formed the executive. CAIC was solely concerned with the provision of services and was the first Stó:lō authority delegated to administer benefits under the DIA's health, social assistance and education programs. Between the early 1970s and 1994, a number of Stó:lō political and service delivery organizations grew out of the EFDC and the CAIC. These included the Stó:lō Forum, Stó:lō Nation Canada, Stó:lō Political Branch, and Stó:lō Tribal Council. As early as 1980, Chief Steven Point proposed the amalgamation of all Stó:lō service agencies. Improve capacity within our Stó:lō community to create and carry out Stó:lō policy, programs and services. The Annual Report for 1995-96 includes the report of the Chiefs' Representative, Steven Point, as well as those from the Aboriginal Rights and Title Department, Community Development and Health and Social Development. The total budget for 1995/1996 was $18,174,722.00. * The old Coqualeetza Indian Hospital garage was renovated and, on April 16th, 1995, Shxwt'a:selhawtxw was officially opened to house the Longhouse Extension Program. Change and the idea that change equals progress emerge as consistent themes in the ensuing years as SN staff worked towards implementing the mission statement of creating a better world for the Stó:lō. 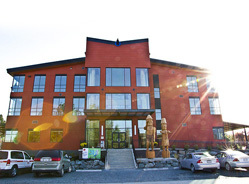 Some milestones: 16 April, 1995, Shxwt'a:selhawtxw (Longhouse Extension Program) officially opened; September 10th, 1999 grand opening of Government House; March 2001 responsibility for child welfare transferred from the Ministry of Children and Families to Stó:lō Nation (building on the first delegation agreement that was signed in 1995); 28 November 2003, completion of the new facility for the Head Start Program and the Day Care Program. Stó:lō Yewal Siyá:m Clarence Pennier (Lands and Environment and Treaty). Stó:lō Elders Lodge construction began 2006; opened May 2007. Plant, Byron. “In Principle: Stó:lō Political Organizations and Attitudes Towards Treaty since 1969 Stó:lō Ethnohistory Field School Paper, 2002. Tennant, Paul. Aboriginal Peoples and Politics: The Indian Land Question in British Columbia, 1849 – 1989. Vancouver: UBC, 1990. Stó:lō History and Information: Before you know where you are going you must know where you've been. ed. by Clarence Pennier. Booklet compiled for the Stó:lō Tribal Council, 1994.